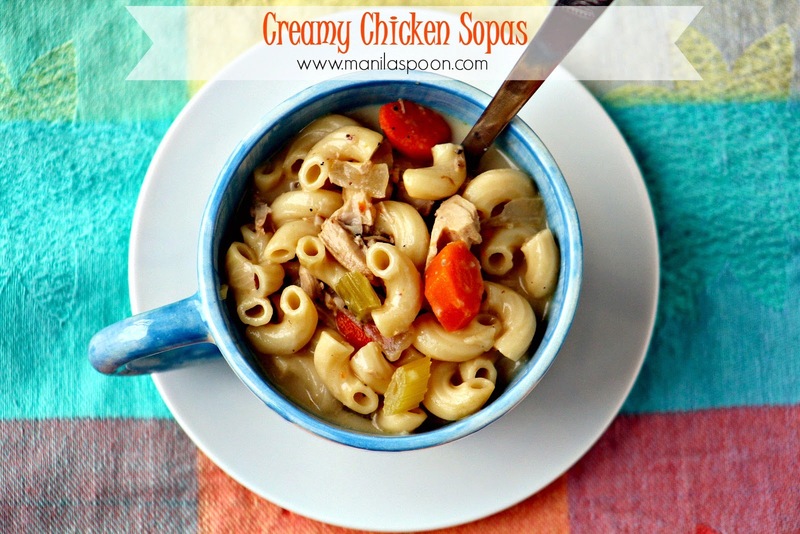 This is a creamy and flavorful Asian soup loaded with chicken, pasta and vegetables. Perfect for fall and winter! I have so many sweet memories of this Creamy Chicken Sopas that my mom always made, perhaps at least once a week. My siblings and I often requested for this and our mom always readily acceded. We have eaten this for breakfast, lunch, dinner and yes, even as a snack. There’s just something so comforting about a creamy soup. This is even more craved for during the monsoon season when it rains all over the archipelago much like we crave for Champorado when it’s cold and gloomy. For flavoring, I add a little patis/fish sauce to the broth. For me that’s the one that gives it that special flavor. There are so many versions of chicken macaroni soup but add some patis (fish sauce) and you truly make it extra special! 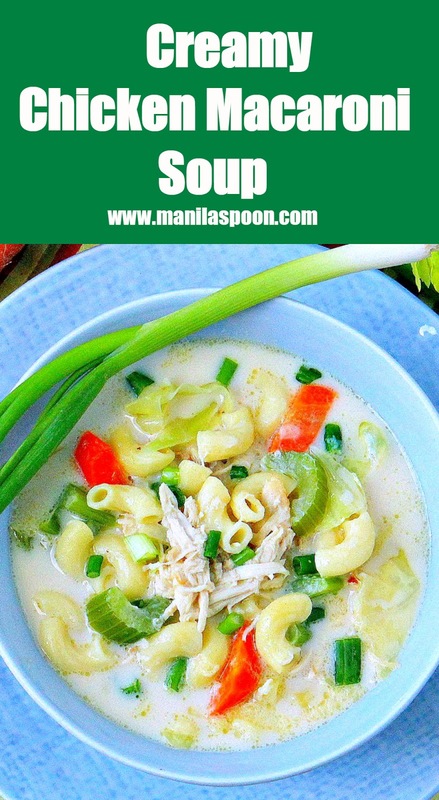 As I think of my fellow Filipinos who are suffering right now because of the damages wrought by Typhoon Haiyan – I cannot help but think that even a small bowl of this soup would truly bring some comfort, perhaps even a smile on their faces. Please continue to pray for the Philippines that they may get the aid and relief that they all so badly need. Thank you very much. Click on the above icon to print. To delete photos, simply click on each image to remove them. *You can just use Rotisserie chicken too, shredded – about 2 cups. * You can use the water/liquid where Chicken was boiled in. This is what we usually use in the Philippines as pre-made Chicken broth are not readily available. *This seasoning is what gives this soup its delicious flavor. Available at the Asian section of your grocery. In a large pan, heat the oil. Saute the onions, garlic, celery and carrots until the onions become translucent and the vegetables are tender about 5 minutes. Season with a little salt and pepper. G'day Abby! Your Creamy Chicken Sopas looks warm and welcoming, true! Reminds me of a soup my mum used to make when I was little too! Thanks, Joanne. I always loved it when my Mom made this for us. Moms always make the best food. 10-12 maybe. It is a big batch. Hai, i bump into ur blog while searching for macaroni soup recipe..
will try n look nice..
Hi Leslie, if the macaroni stays long enough in the soup, it gets soggy which explains why I add it separately although you can actually cook them all together just ensure that you don't overcook the macaroni. Cook it until al dente (fully cooked but still retains some bite). The only other way is to eat them immediately. I cook the broth separately so I can just add the macaroni when I need it, so it's only added when you actually want to eat it so it doesn't get soaked up in the broth and gets soggy. Hope that helps. I have an unusual method of making sure the noodles don't get soggy and it's delicious. I stir fry the uncooked noodles until golden brown all over and then cook the noodles in the boiling broth. No mushiness! Delicious! What a great idea, Sheri! Thanks for sharing that. I will try it for sure! Can I use Nestle Cream instead of evaporated milk to make it creamier? Hi Paul, I personally think that Evaporated milk is better as it doesn't overpower the taste of the soup itself (not overly milky in taste). But you can try the cream for sure, just add it at the end and lessen it (not as much as the evaporated milk) 'cause it will be too thick otherwise. Thanks for asking. Hope you enjoyed it Ailyn! Thanks for stopping by! Ahhh! I love this. My mom used to make this a lot when I was little. This dish always makes it to our dinner table on a monthly basis (at least!). Enjoy! Whenever I make sopas, it's always gone within a day. I wanted to make a big batch and freeze it so it'll be on hand. Have you ever tried freezing it to store? I'm a little weary since it does have milk in it. The pasta may get mushy and the milk might separate and get grainy if frozen. If you want to freeze leave out the pasta and milk and add them later. This is perfect for winter! I would like to try your recipe tomorrow for 50 persons, can I just exclude celery because I don't like it..will the taste still be the same? You may leave out the celery but make sure to add extra carrots and cabbages so the soup's consistency remains even and not too diluted. Enjoy! Do you think it will be OK to use Cream of Mushroom instead of evaporated milk? I haven't tried it personally but if you do, please let us know how it went. Thanks Rushelle!